The Canopy Bookstore is closing its doors for the year–or pulling down the tent, however you want to put it. But before I send the leftover books back to their authors, I thought I’d offer my readers here a discount on them. This week, I’m offering Joab’s Fire for the special price of $11.99 plus $5.00 shipping. Although Joab’s Fire is set in Canada’s Northwest Territories in 1903, the story itself is far older, predating Christianity by roughly 4000 years. It’s a cleverly written modern rendition of the story of Job. Lynn wove the lives of two men, Joab Black, who suffered from all the same arrows Satan aimed at Job, and Sgt. Clarence Dixon, who watched his struggle. Dixon, an official in the Northwest Mounted Police, is haunted by a past he believes God will never forgive him of. And as he watches Joab’s suffering, he no longer cares. If such a righteous man can suffer such atrocities, there either isn’t a God, or God isn’t just. Either way, Dixon insulates himself from the still, soft voice calling him to repentance and salvation. Although she currently lives in California, Lynn was raised on a farm in southern Alberta, Canada where she “spent her days playing a pioneer or a character from a book (and every so often succumbing to her parents’ work ethic).” She chose the setting based on her great grandparents’ struggle to settle the wild and vast land. The occurrences in the book are actual events in Western Canadian history. 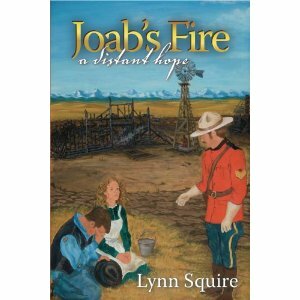 Lynn did her research, and did a wonderful job blending Canadian history with the ancient story of Job to come up with a page-turner of a novel. If you’re interested, contact me at pprmint777@yahoo.com, and I’ll get the book in your hands in no time! This entry was posted in The Canopy Bookstore. Bookmark the permalink.